The Village of North Falls is an active lifestyle community in Delaware, Ohio. Developed by well-known builder Epcon Communities, this established neighborhood consists of just 124 low-maintenance attached homes. With a small number of residences, it provides an intimate community setting where homeowners can get to know each other easily. A charming clubhouse also provides a common space where neighbors gather to socialize and have fun. Located in Delaware County, residents have easy access to major roadways as well as shopping and dining options. They are also within walking distance to a library and park just outside of the community's entrance. Columbus is a 30-minute drive for additional entertainment and attractions. This close-knit community features a clubhouse with great amenities that allow homeowners to socialize in a friendly atmosphere. The clubhouse has a gathering room where neighbors can mingle and build new friendships. An exercise room is equipped with cardiovascular and weight-training machines that help them stay active and in shape. Residents can play fun games at the card or billiards tables. Outdoor amenities are superb as well. A swimming pool is the perfect spot to cool off on a hot summer day. The patio is useful for enjoying a beautiful morning sunrise or to read a good book while getting some fresh air. Residents can also take leisurely strolls along the neighborhood's walking and biking trails while enjoying scenic views of the ponds and natural space. The Village of North Falls was developed by Epcon Communities between 2004 and 2011. It consists of 124 attached homes spread across 38 acres of beautiful landscape. Eight unique floor plans were offered that range in size from 1,140 to 1,926 square feet. They have one to three bedrooms, two or two-and-a-half bathrooms, and an attached two or two-and-a-half-car garage. All homes feature low-maintenance exteriors as well as brick and wood or stone and wood facades. Other features include vaulted ceilings, oak cabinets, laminate wood floors, stainless steel appliances, garden style patios, and sunrooms. A homeowners' association (HOA) fee includes lawn maintenance and snow removal for all homes. Thanks to the HOA for taking care of tedious exterior home maintenance, residents have more time to relax, have fun, and do as they please. Neighbors gather at the clubhouse to play billiards or cards. They can swim in the pool or read a book on the patio. Homeowners can start an exercise group with friends and jog along the walking and biking trails to stay healthy. This small and tight-knit community will allow residents to bond with others over similar interests. This age-targeted community is located in Delaware, Ohio. Residents are within walking distance to a public library and local park. They also have easy access to major roadways like Route 23 and Interstate 71 for getting around town. A Menard's, Kroger Market, Walmart Supercenter, Kohl's, and a variety of restaurants are close by as well. Polaris Fashion Place is 15 minutes away. A quick 30-minute drive to downtown Columbus offers more shopping, dining, and attractions as well as healthcare facilities. Homeowners will find Mt. Carmel West Hospital, Nationwide Area, Columbus Convention Center, Columbus Museum of Art, and Franklin Park Conservatory and Botanical Gardens. When traveling farther is necessary, Port Columbus International Airport is nearby. 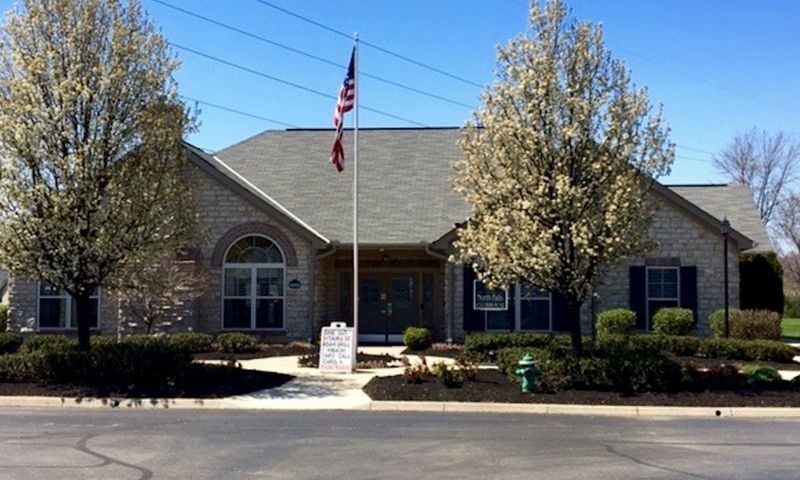 Residents will love the low-maintenance homes and prime location at The Village of North Falls in Central Ohio. There are plenty of activities available in The Village of North Falls. Here is a sample of some of the clubs, activities and classes offered here. The Village of North Falls was developed by Epcon Communities between 2004 and 2011. It consists of 124 attached homes spread across 38 acres of beautiful landscape. Eight unique floor plans were offered that range in size from 1,140 to 1,926 square feet. They have one to three bedrooms, two or two-and-a-half bathrooms, and an attached two or two-and-a-half-car garage. All homes feature low-maintenance exteriors as well as brick and wood or stone and wood facades. Other features include vaulted ceilings, oak cabinets, laminate wood floors, stainless steel appliances, garden style patios, and sunrooms. 55places.com is not affiliated with the developer(s) or homeowners association of The Village of North Falls. The information you submit is distributed to a 55places.com Partner Agent, who is a licensed real estate agent. The information regarding The Village of North Falls has not been verified or approved by the developer or homeowners association. Please verify all information prior to purchasing. 55places.com is not responsible for any errors regarding the information displayed on this website.